My dogs love this! Terrific used as a mixer with dry or fed alone once or twice a week. This is a wonderful product, with naturally occuring enzymes. 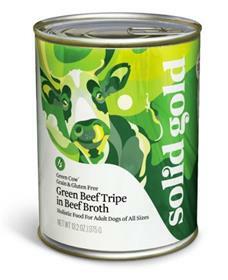 My dog Helena suffers with a diagnosis of thyroid problems as well as cushings disease- I put her on the Solid Gold Green Cow Tripe (2 tbsp) daily along with some other Solid Gold products and she is doing very well. Her eyes seem to be much more clear and her all around health has improved.